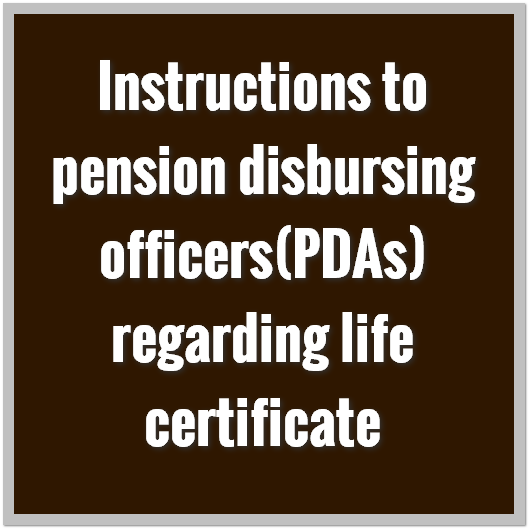 The submission of annual verification (life) certificate through Digital mode is only an additional facility to the pensioner. Through Digital mode, so far around 2,16,717 pensioners have submitted their life certificates. There is some problem with very old pensioners (especially women) for submission of Digital life certificates. When the issue was taken to the notice of the Government, Government, vide memo 4th cited have directed the CEO, APCFSS for the supply of IRIS scanners. But due to some technical problems, the CEO has not been able to supply the IRIS scanners so far. 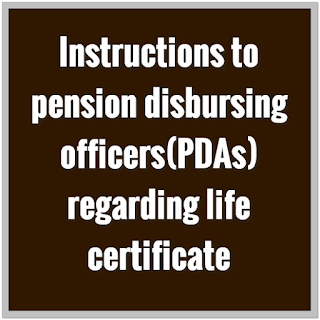 In the light of the above, the following executive instructions are issued for strict observance by all pension disbursing officers(PDAs) in the State. When the pensioner is unable to submit the Digital Annual verification certificate due to wear and tear of fingers, physical AVC may be obtained from all such pensioners duly verifying their physical presence by the ATO/STO in person or through Whatsapp/FB messenger Video calling. As ordered by Government vide Memo 4th cited, the physical life certificate shall be attested by Gazetted officer located in the jurisdiction of the SubTreasury only, duly quoting his employee id and contact phone number and by the pay bank manager of the bank branch where the pension SB A/C is existing. If due to any reason, the pensioner is unable to appear before the ATO/STO personally, the pensioner shall be verified through Whatsup/FB Messenger Video calling by the ATO/STO and only after being satisfied with the physical existence of the pensioner by the ATO/STO, such physical life certificate shall be accepted. In respect of physical AVC (Life) s received through Registered post, the pensioner shall be verified through Whatsapp/FB messenger video calling and after satisfactory verification only such certificates received through post shall be accepted and such certificates shall be attested only by the local Gazetted officer/pay bank manager and not by gazetted officers of other districts/states. In respect of bedridden pensioners, ATO/STO may take a positive view and visit the house of bedridden pensioner to verify his/her existence. As an alternative bed reddens pensioner may also be verified through Whatsup /FB messenger video calling after obtaining physical life certificate. In respect of pensioners living in other countries, the physical life certificate shall be attested by the officials of Indian embassy/Consulate/ registered notary of that place and on receipt of such life certificates, ATO/STO may verify such pensioner through Whatsup /FB messenger video calling. But whenever pensioner comes to India, he/she must ensure to be physically present to the Sub-Treasury Officer and submit the certificate again for verification. Pensioners who fail to provide their Aadhaar number shall be physically verified by the ATO/STO with utmost caution and care. But after such verification, they should not be denied their monthly pension until further instructions from this office on obtaining of Aadhaar Number. In respect of pensioners who have submitted their life certificates through'"Jeevan Pramaan" separate instructions will be issued shortly. In respect of pensioners having Aadhaar number obtained in other states, which is not accessible to us, physical life certificate (AVC) may be accepted by the STO/ATO after verifying the pensioner in person or through Whatsapp/FB messenger video calling. Flowever the Aadhaar number shall be captured on the AVC and in the Master data. Digital AVCs already received will be in the login of respective STOs. As per Para (2) of Memo 2nd cited, the ATOs/STOs shall immediately take out the printout of the Digital AVCs, compare them with the respective PPOs and the Digital AVC shall be confirmed by STOs between 15-02-2018 and 15-04-2018 without fail which should be monitored personally by Deputy Directors of respective Districts. Staff support from DTO shall be provided to Heavy SubTreasuries for confirmation of Digital AVCs.